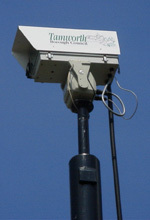 There are 78 cameras located across Tamworth, funded by the government and Tamworth Borough Council. Working with the police, Tamworth CCTV can view and process third party footage. The CCTV Vicon digital system is monitored 24 hours a day, 365 day a year. Who do I contact if I have a complaint? You can contact any Staffordshire police station or local authority office. Any complaint will be dealt with in accordance with existing rules and regulations to which all members of the police and local authorities - including CCTV operators - must comply with. What is Closed Circuit Television? It is a television system, which operates on a "closed loop" basis. Unlike broadcast television, which is available to anyone with a suitable receiver, CCTV pictures are only available to those directly connected to the loop, which in Tamworth's case, is the central monitoring control room. The loop is a physical link consisting of a fibre optic cable, which carries the picture from the camera to a monitor. Who sees the picture? Tamworth Borough Council employ officers who continually monitor the pictures 24 hours a day, 365 days a year. Any pictures viewed by the operators can also be seen by Staffordshire Police officers. Who has access to the control centre? Access is restricted to the CCTV Manager, maintenance contractor, police and the CCTV operators. It is restricted to protect the integrity of the evidence that is recorded on a daily basis. Operational procedures and a code of practice based on Home Office guidelines strictly control the centre's operation. These cover every aspect of the running of the CCTV system, for example where the cameras should or should not be looking. How are the Police alerted to an incident? Tamworth Police are alerted to an incident via the police radio in the CCTV control room. The operators are in constant contact with the police's central control room. The police radio has the capability for the CCTV operator to speak to an officer at an incident on a one to one basis, much like a mobile phone. How long are the images stored on file? Public space CCTV images are retained in secure storage for 31 days, and then destroyed without viewing unless required by the police for investigating an incident. How do I get access to CCTV images? You can submit a Subject Access Request (SAR) form. These are available from our main reception at Marmion House. All members of the partnership, (i.e. all local authorities and Staffordshire Police) must register their use of CCTV with the Data Protection Registrar. For the purpose of "crime prevention, crime detection and public safety and for the prosecution of offenders". This is further supported and encompassed in UK law, by both the Data Protection Act 1998 - CCTV Codes of Practice (July 2000), and the Human Rights Act 1998.